Disappointing to see Steven Cox starting off his campaign by making a dishonest claim against his opponent that she voted to double her salary. Public outrage, including former Mayors and sitting members of the City Council saw this ridiculous increase negated and reset to a little more reasonable 4% increase. Very cool. Unfortunately this is Vancouver and Steven’s got about zero chance of winning, but it’s great that’s he’s giving it a shot. I only know of him by his FB presence, but he seems top notch as a Republican candidate. 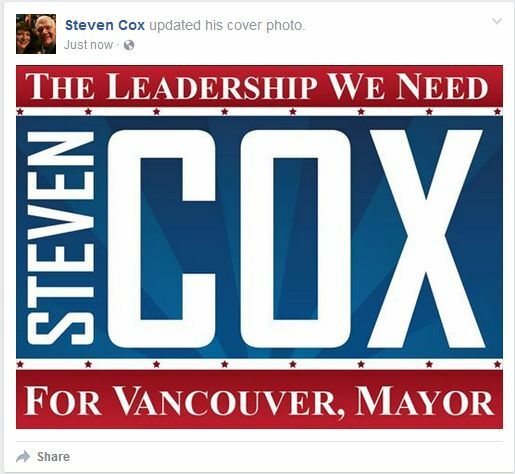 Go Steven Cox. A ‘dishonest claim’ implies that Cox is lying. Maybe he just misunderstood or misinterpreted her position on the matter. He could very easily have checked her position well before making such a dishonest claim. The ludicrous raise proposed by the Salary Commission was well broadcast last year as well as the positions of council members.